A court this evening upheld an urgent request filed by Malta Public Transport against the Union Haddiema Maghqudin to stop industrial action which led to a chaotic situation at the Valletta terminus this evening. The company filed its request following industrial action by the union which claimed that the company was delaying the union recognition verification process. The union ordered drivers not to collect fares from the passengers or handle ticketing machines. The company said it was only given an hour’s notice of the directive, forcing it to resort to the court to stop the union’s “illegal and abusive” action. The company then ordered drivers obeying the union’s directives to stay at the terminus. As a result, a chaotic situation ensued at the Valletta terminus with only one in five buses going on service. UĦM president Jesmond Bonello said the company also ordered drivers to amalgamate routes with bus drivers who were operating covering four routes instead of one. The company also tried to rope in drivers who were off to bring the service up to 50 per cent, as required by law, he said. Addressing a news conference this afternoon, UĦM secretary general Josef Vella said the result of a vote on representation taken among workers showed that the UĦM had a 56 per cent representation. Mr Vella said that in spite of the result, which the bus company had had for days, it still failed to give the UĦM recognition. “It is unacceptable that the company is denying its workers this basic and most fundamental of rights,” he said. During the press conference, Mr Vella was accompanied by Joachim Perez Da Silva, a representative from Union Sindical Obrera that represents workers from Autbuses de Leone in Spain. He said he spoke to industry sources in Spain as well as to the company about the matter. His union, he said, expressed solidarity with the workers and joined the UĦM's call for workers to be given the representation they wanted. Asked how much was the union's action costing the company, Mr Vella said he did not know but knew that the fact that workers were being denied representation by the union of their choice had cost them millions of euros. He described this "battle for recognition" as the longest fight for recognition in Malta’s trade union history. 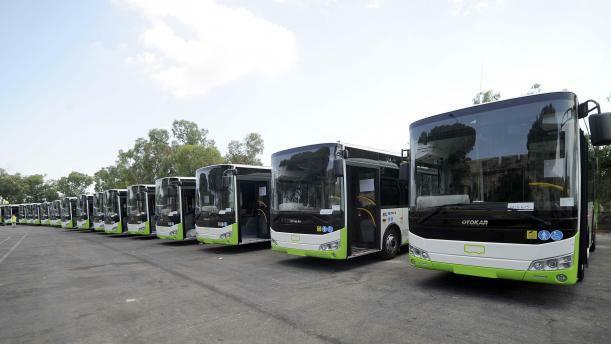 But Transport Division Director for Autobuses De Leon Julio Tironi said it was not true that the company was delaying the recognition process. “Once the company was given the clearance by the courts to carry out the verification exercise, it immediately initiated the process, which is now in the final stages. The company, he said, had only received the formal report from the Director of Industrial and Employment Relations confirming that the UHM enjoyed majority support this afternoon, after the union issued its directive. “If this is confirmed once the formal process is completed in the coming days, the company will give the union recognition. This will be a very important milestone to restart the collective agreement negotiations as soon as possible for the benefit of employees and to allow us to improve the service,” he said. The Union Ħaddiema Magħqudin this evening instructed bus drivers not to drive the 12-metre long buses, as it continued on its warpath against the operator, even if it suspended some of its actions. The 12-metre buses make up a large portion of the fleet, UHM CEO Josef Vella told a news conference this evening. Drivers have also been instructed not to wear uniforms as the saga over union recognition continues. The union, however, suspended some off its bus drivers' action after officially being informed of a court sentence handed down last night. Until this morning, the union instructed bus drivers not to charge passengers, and to provide them with misleading and wrong information, but a court order ruled the action illegal. Mr Vella said Malta Public Transport’ management should be ashamed of themselves for constantly being in the news “for the wrong reasons”. “We represent workers at several companies but this company always seems to present problems. Now it seems to think it can use an iron fist,” he said. Mr Vella said the union had chosen to respect the court order even if this showed that unionism and workers’ rights were “under threat”. He said he would not exclude escalating measures including calling a strike of up to half of the drivers. Mr Vella said he could not understand why the company was choosing to use its resources to fight against its industrial action, rather than getting on with verifying the union’s representation. Malta Public Transport said this afternoon that the UĦM will be held responsible for all the consequences of drivers disobeying the court order. "It is inexplicable that the UĦM has a total disregard for the court order. This is irresponsible and will have inevitable consequences," Julio Tironi, Transport Division Director of Autobuses De Leon said. “We will have no alternative but to hold the UĦM responsible for all their actions and for the actions of those drivers that are following their instructions." Malta Public Transport said it has no dispute with the UĦM and there is no reason to involve the employees in such actions which have absolutely nothing to do with the verification process.